When it comes to small bathroom makeovers, it’s easy to feel overwhelmed. A complete overhaul may seem like an appealing (or the only logical) option, but it’s important to take note of the integral components of the room, and make changes based on your daily needs and style preferences. Adding additional sources for storage, repainting the walls, or completely restructuring the bathroom are all crucial aspects of a remodel. Enter some cool before and after bathroom makeovers that may inspire a little change of your own. 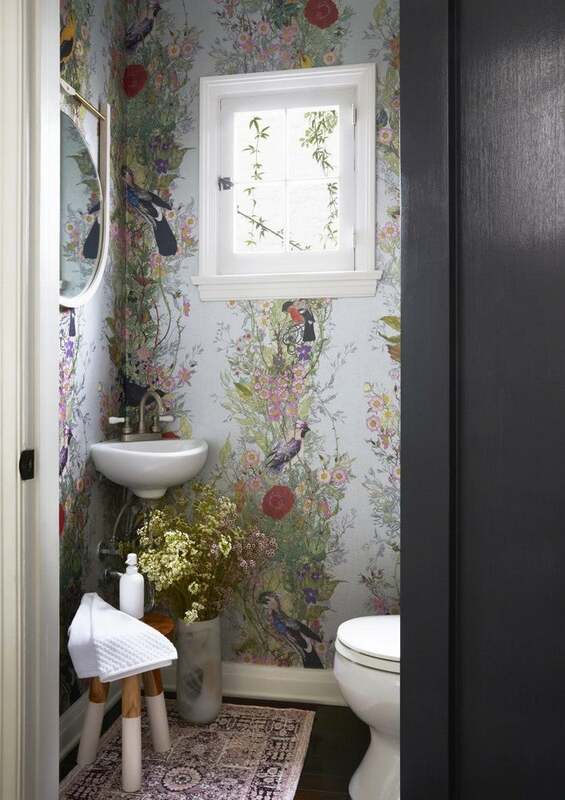 A tiny room doesn’t necessarily equate to a boring room, but the dated wallpaper and lack of decorative touches in this powder room aren’t exactly exciting. A couple tweaks later, you’d hardly believe this was the same lifeless 15-square-foot room. For designer Dee Murphy, the key to creating a fun space within the very real restrictions was wallpaper: “We wanted to make a big impact, and the easiest way to do this was with a drop-dead gorgeous wallpaper,” she says. A mid-century modern mirror further modernizes the room, which is part of a home that dates back to 1926. This house dates back to the 1920s, and the original bathrooms were practically falling apart and dysfunctional. The upstairs bathroom was totally gutted, but the designers restored the clawfoot tub and added in a glassed-in shower. They replicated the original tile to give the walls a fresh makeover, and they added some greenery and a modern wooden add warmth to the space. See the whole home makeover on Domino. While there wasn’t anything inherently wrong with this kid’s bathroom, the dated finishes left a lot to be desired and the half wall made the space feel smaller. Talk about a transformation: Designer Jenny Komenda gutted the room, and started with an all-white base for a clean palette. She added easy-to-maintain tile flooring in a herringbone pattern, along with marble countertops, on top of a gray-blue cabinet with plenty of storage. Knocking out the wall also allowed her to add a second sink, so the kiddos don’t have to share. See the complete dramatic transformation here. Not only was the original vanity too small for the space, but the dated style was dull and uninspired. A new matte black cabinet offers additional storage and counter space, while the bold black and white tiled floor adds interest. Check out the full house makeover here. The cheap-looking plastic shower curtain and mismatched accent rugs create a space that errs on inconsistency. Plus, with everything cramped together, the bathroom looks tiny. If you have a difficult room structure to work with, take note: The chic tub works well at the lowest point of the slanted ceiling, while the open shower nicely complements the higher spots. This whitewashed room featuring chic accent pieces is a minimalist’s dream. Read more about the transformation—the homeowners had to gut the entire room—on Country Living. Despite the mismatched wood-and-tile-paneled walls, the relatively open and simple structure of this room makes it a prime candidate for a makeover. This bathroom is brighter, more spacious, and features both a stand-alone bathtub and a walk-in shower, which fit the homeowners needs for handicap-accessible space. The contrasting tiles on the floors and walls are a small touch that makes the space more interesting. Matching gold hardware keeps the decorative scheme streamlined. Get the scoop on the inspiration behind this renovation on Design Sponge. With low lighting and retro-looking (not in a good way) fixtures, this bathroom is in dire need of a modern update. If this doesn’t look like the same bathroom, it’s because it’s undergone a serious renovation that shifted everything around —and the end result is gorgeous. Sherry Hart of Design Indulgence swapped the windows for skylights, which allows for unobstructed natural light that instantly makes the bathroom brighter. The wood panel accent wall behind the sink makes a much-needed statement. The dark colors and poor lighting make, what is really, a spacious bathroom seem small and cramped. This bathroom is an excellent example of the difference the right wall color and lighting can have on a space! Having swapped out the dingy paint and linoleum floors for modern, sleek tiles in a classic black and white combo, the bathroom instantly looks more bigger. Plus, how cool is the exposed black ductwork? Head over here to find out how designer Kristina Lynne made this transformation happened. Brown walls, wooden floors, and a bulky, black sink surround limit the potential of this small bathroom. The brushed silver details of the mirror and fixtures certainly don’t contribute to the space either. Amber Interiors reinvented the space with a complete whiteout, paving the way for an intricately patterned floor tile and an overall elevated decor scheme. A black marble vanity paired with a black steel base and a leather-wrapped mirror complement the minimalist aesthetic of the space. The modest composition of this master bathroom comes with a monochromatic color scheme and streamlined details of a contemporary make. The all-encompassing mirror was swapped out by Amber Interiors for a more dynamic tiled backdrop and two personalized vanities, while the walls were painted white to brighten the space. A light wood sink surround provides a pleasant contrast against the dark tiled flooring as well as the chromatic fixtures of the room. A faded color palette instantly dates this bathroom while the massive double sink cabinet takes up valuable floor space. A bright and light makeover by Faded Plains completely transforms this small bathroom. Separate his-and-hers vanities allow for a more free-flowing space and an effortlessly elegant yet rustic decor scheme. Industrialized lighting above each mirror and textured wood details scattered about the room lend warmth to the room. The outdated furnishings and weathered cabinetry of this small bathroom evoke an enclosed sense of space. The traditional sink surround and medicine cabinet combo could use a serious remodel! Cami of Tidbits completed a stunning transformation in which a standing shower was traded in for a more elegant claw foot tub and shower combo, conveniently placed by the window. The sink area, moved away from the window wall, was redone with a farmhouse chic meets rustic industrialism scheme. Light wood flooring and white wood paneled walls further complement the aesthetic of the room. A basic floor tile coupled with taupe walls and industrialized metallics form a rather gloomy space. A whitewashed wall paint extends throughout the room, accentuated by the navy cabinetry and bright red pulls as well as the eclectically patterned floor tile. Cherry wood shelves replace the bulky cabinets from the original space, creating a more open source for shelving. A chic hanging bulb above the mirror provides the perfect lighting accent. Get the scoop on the makeover, here! A bubblegum pink wall paint coupled with the weathered cabinets, wood flooring, and gold-esque hardware sets the tone for an outdated bathroom in need of a modern revamp. Faded Plains whitewashed the space for a more light and airy feel. Reclaimed wood shelves within the nook behind the tub provide additional sources of storage, along with the sink surround. A bit of white paint transforms the clawfoot tub. This story was originally published April 2016. It has been updated with new information.